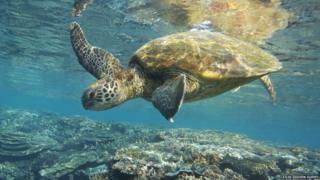 Ever fancied diving in the Great Barrier Reef? Soon you'll be able to do it all online! A team of scientists will be taking thousands of 360 degree pictures of life underwater. Eventually, they'll all be stitched together and put online so you'll be able go for a virtual dive - the same way you'd look at pictures on Google streetview! 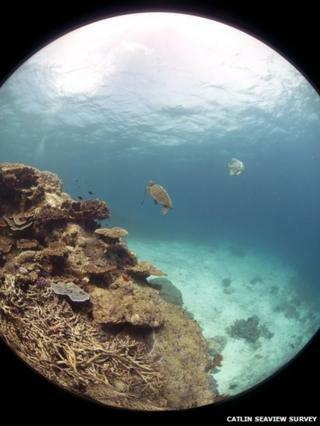 The camera will take panoramic pictures every 4-6 seconds when it's underwater. The design for the camera was inspired by animals like sharks. 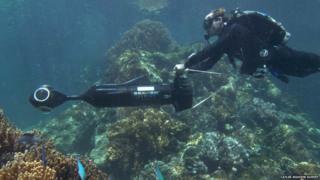 The scientists will also use diving robots that will go 100 metres underwater. This is further than any scuba diver could go and will give them a better idea of what creatures could be hiding at the bottom. 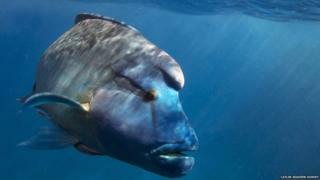 The Great Barrier Reef is home to over 1500 different species of tropical fish - just like this humphead wrasse. 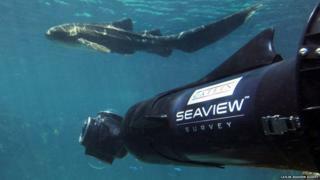 As part of the project, 50 animals will be tracked using satellite tags - this means scientists will be able to better understand the animals behaviour and how they react to warming waters. The Great Barrier Reef, off the coast of Australia, is one of the seven wonders of the world. Tourists travel there to swim alongside the beautiful coral and wildlife - but soon you'll be able to do all that from the comfort of your own home! This picture of a green turtle came from the test mission, they've already found a new species of pygmy seahorse and four types of coral that had never been seen there before. The main expedition will kick off in September 2012.